Glass-Fused-to-Steel (GFS), also known as Glass-Lined-Steel (GLS), is the ultimate tank and silo solution utilising a proven product with significant benefits to customers, consultants and contractors over other types of tank and silo construction. Glass-Fused-to-Steel gives significant benefits over other tank and silo systems. Two materials are fused together to achieve the best of both materials -the strength and flexibility of steel with the corrosion resistance of glass. 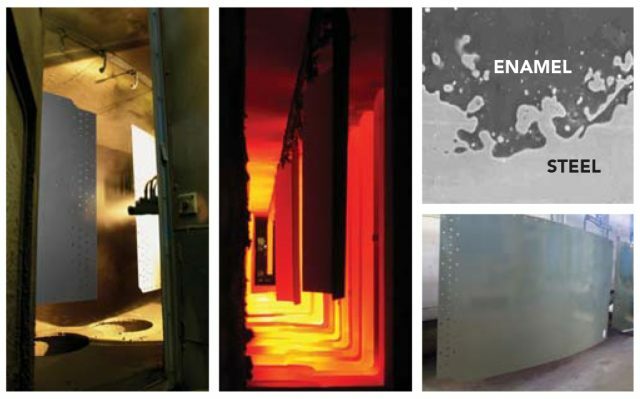 Applied to both interior and exterior surfaces, Glass-Fused-to-Steel is able to provide many years of trouble free service in harsh environments. This standard provides guidance covering both the structural design and the finish coating requirements for all tanks used in the municipal and industrial markets. Permastore is a manufacturer of Glass-Fused-to-Steel tanks who are able to provide independently audited documentary evidence of compliance with the full requirements of this International Standard. EEA 7.20, EEA 7.24, EEA 7.25 – “Vitreous enamel coated bolted steel tanks / silos”. PERMASTORE® Glass-Fused-to-Steel tank coatings exceed the requirements of this European Quality Regulation. ANSI / AWWA D103-09 – AWWA Standard for “Factory-Coated Bolted Steel Tanks for Water Storage”. BS 5502 parts 50, 22 and 75 – “The Control of Pollution (Silage, Slurry and Agricultural Fuel Oil) (Scotland) Regulations 1992 and 2001″, ensuring secure slurry storage solutions. Permastore provides tanks compliant with these standards as well as being suitable for other design criteria and local environmental factors. *Only products bearing the NSF mark are certified. ISO 9001:2008 – Accreditation of Quality Standards since 1996 to guarantee consistent customer satisfaction. DWI – Approved by the Secretary of State to Regulation 31 for drinking water. MPA NRW – Fully independent auditing of Permastore Quality Standards, to ensure compliance at all times.